cheese before or after dinner varies by country but is wonderfully delicious either way. do what makes you happy. In the United States cheese is usually served with drinks before sitting down for dinner. Where this custom originated I am not sure because outside of the US, you rarely see cheese served before dinner, except in Italy with a large wheel of parmiggian reggiano to chunk out pieces during an aperitivo. I love, love cheese and therefore I like it to take center stage with its very own course. But that is a personal preference. In Europe, cheese is served after dessert- in France the saying goes, sweet before salty. But just to confuse you in England the cheese is served after the main course and before the dessert or pudding. 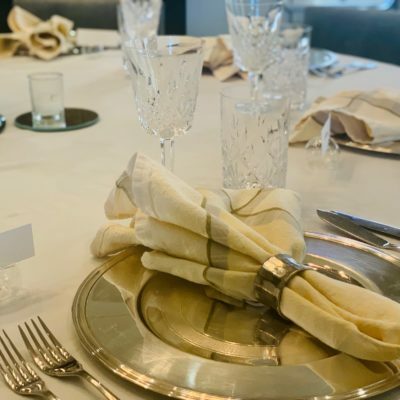 As with most cultural norms in our ever-melting world, it does not really matter (unless hosting a very formal event). Once again do what makes you and your guests most comfortable. Regardless of when the cheese is being served, here are a few tips to make it even more delightful and delicious. cold cheese, just out of the refrigerator, does not taste as good as when it is brought to room temperature. Often you will find that the flavor is not as deep and rich when served cold compared to when served slightly warm. Strictly speaking, the “nose” or end of the cheese should not be cut off. The nose is where most of the lovely flavor and texture lies, and if one guest cuts it off, the others cannot enjoy. Therefore hard cheese and semi soft cheeses should be cut on an angle. I like to serve cheese whole, as it is fresher when cut right off the piece. However for larger parties (10 or more) I may cut a few slices to make process easier for guests. Each cheese should have its own knife to prevent cross-over of flavors. From mild to strong and from soft to hard, it is good to select a nice array of varieties. 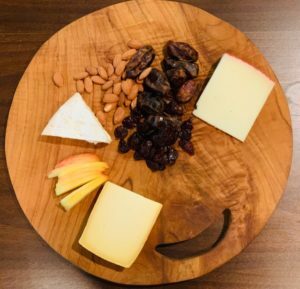 I usually select about two to five cheeses and will serve on two different cheese boards that circulate around the table. You also want a a selection of different crackers and breads, two to three is good. Select crackers that will complement your cheese selections. Also think about your guests and their potential preferences- are they more adventurous eaters, than go for rich Roquefort or a Limburger but if not stick with milder and more familiar types, Brie, Camembert, St Andre, Manchego. Cheese boards that are full of ingredients look beautiful but are awkward and impractical for your guests to easily partake of. 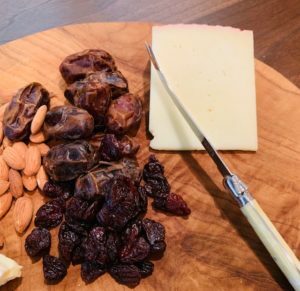 Make sure there is enough room around the cheese for guests to cut a piece without shooting a pecan or grape across the table. 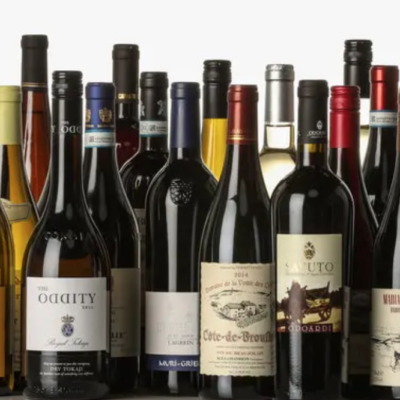 Whether you find a selection of fresh red grapes or stick with dried apricots, dates, cranberries, the sweetness of a fruit balances the texture and flavors of cheese. I often find Quince paste (a Portuguese favorite) is perfect–found at specialty delis and grocers. But I love to serve with dried fruits depending on the season. For winter, definitely dried apricots and dates, and any type of chutney is a great option. 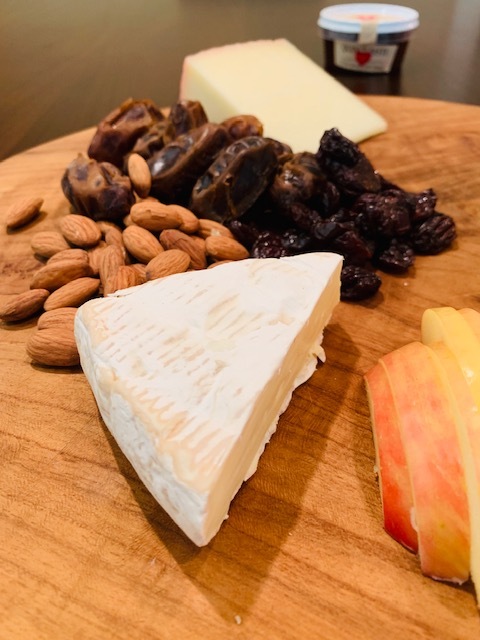 Any type of nut is nice to add to a cheese board- whether on the board or served in a bowl on the side. I like to serve walnuts, pecans or almonds just for a little crunch. For the cheese course, give each guest a dessert-size plate with a knife and a fork. Some people prefer to use just a knife but good to give both options.